Here's my low carb version of lemon curd which I made for my lemon almond tarts, it's very moorish. I used another online recipe this page as my guide which I then made low carb and converted to Australian measurements. I chose this one basically because I preferred the cooking method (I hate having to cook things over boiling water) and didn't want it to be overly rich but very lemony. Having said that, we do have two other versions that you might want to try. One using all yolks by Sinders here as well as another version by Olivia that is pretty similar to this one but doesn't use the rind here. If sweetener is coarse grind to a fine powder, I use one of those cheaper version of the magic bullets, works well. I chose to do this, because the xylitol is very grainy in texture and I want to make sure it dissolves properly. Push the eggs and egg yolks through a sieve and place in a heavy based saucepan, add other ingredients and whisk. Turn on stove to low or medium depending on how game you are and whisk continuously until starts to slightly thicken then stir continuously with a flat bottom wooden spoon making sure to scrape bottom of pan. If you see a slight lump forming take straight off heat and whisk until smooth then place back on heat. Continue until very thick and coats the back of the spoon. I switched from low to medium heat a few times and found this didn't take very long at all. Make sure to have a look at the pictures in the original link to get an idea on how thick it should look. The author of the recipe suggests to strain the lemon curd through a strainer to ensure a smoother consistency but I found that mine was looking pretty smooth anyway, perhaps because I strained the eggs prior which was a tip I saw elsewhere when I was searching for a recipe to try. Pour into a sterile jar and place a piece of baking paper (cut to fit shape) with a tab sticking out so you can grab it easy, cover and chill. Note 1: I found this very yummy and sweet, I will probably drop back a touch on the sweetener next time, perhaps 1/4 cup xylitol and say 10 splenda tablets and see how that goes. I forgot to take any pictures when I made it, but the picture above is how it looked today when I was making my tarts (recipe to follow shortly). The post was edited 4 times, last by Sherrie: .update ( Mar 24th 2016, 1:31pm ). I've been making a fair bit of curd myself lately. If you like curd, try making it with fresh lime juice, passionfruit or pureed raspberries. 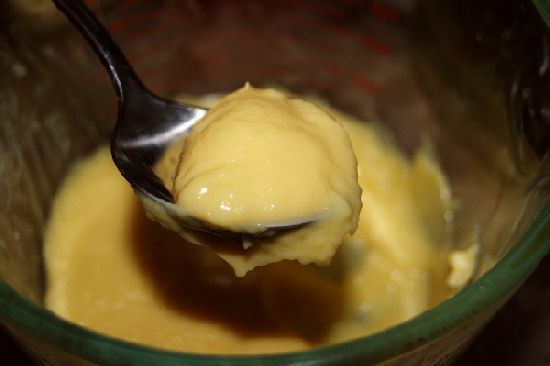 My latest batch of lime curd was heaven! I have been thinking of making a passion fruit one, last year there was a recipe for one in a mag that I used to make lemon cupcakes and poppy seed bikkies but never did do it, not sure why. A raspberry one would be pretty cool. Can you pretty much do this with any fruit? Well I haven’t had a failure yet as far as using different flavours. Funnily enough, the lemon curd is my least favourite of all the ones I’ve made so far. I thought it had a slightly ‘off’ flavour but DH said it was just like his mum used to make. I also think it depends on the sweeteners you use (I use a cocktail of erythritol, stevia, polyd and inulin). The raspberry curd had a sort of cheesecake flavour about it and the passionfruit was my favourite until I made the lime curd again last week. The post was edited 1 time, last by Sherrie: Removed dead link ( Sep 13th 2015, 7:45am ). I liked the lemon curd, it had a real bite to it. Its funny I have taken a leaf from your book and combined sweeteners. Xylitol on its own tastes like "sweetener" to me as does splenda some times yet the two together taste like sugar. Even Garry can't pick it and he always picks the splenda taste. I made a banana and blueberry loaf for Garry and Ryan the other week which was the first time I combined them (think I ran out of splenda, not sure?) and it was really nice. I only have granual splenda so how much would i use? Or do i need to get the tablets?? Finely grate the lemon peel. Squeeze lemons to make 1/2 cup lemon juice into a microwaveable 4 cup container. Stir in rind, butter, and sugar.Microwave uncovered on high for 1 and 1/2- 2 minutes. or until butter melts and mixture is hot. Beat eggs in a bowl. Gradually add the hot lemon mixture to the eggs, stir constantly. Return to the microwave container and microwave on med. for another 1- 2 min., stir every 30 seconds, until it is thickened. Do not boil. It will thicken as it cools. Store in the fridge for up to 2 weeks or freeze for longer storage. This is also fine with Splenda instead of sugar. Use 1 lime, tangerine, or orange in place of one lemon. yum, nom, nom, nom. I made this today, it did seperate but I fixed that with the stick mixer (must have let it get too hot too quick). Its now cooling in the fridge. I just made 2 little tart base for the lemon butter using Empower bake mix. I used about 3 tbspoons bake mix 1 tble sp each of coconut and melted butter, drop of almond ess. 1tsp splenda. Mixed till dough like. This is what I did....Used my silicon muffin tray, cut 2 larger squares of baking paper to fit and overlap each hole. This is only enough mix to make 2 so put half into each hole then I used my vitamin bottle and a bit of extra paper to cover the base of bottle and pushed this into the middle of dough to form the tart case shape. Cooked for about 20 mins at 170. Once cool I added some lemon butter and ate, non, nom, lovely and the case was crisp too. The post was edited 1 time, last by PP ( Sep 14th 2009, 3:20pm ). Tart case with lemon butter, looks a bit rustic I know but tastes yum. I think the lemon butter was a lighter colour because I only used whole eggs no extra yolk. The post was edited 1 time, last by PP ( Sep 14th 2009, 5:25pm ). MethodFill 2 glass jars with boiling water to sterilize. Crack the eggs into a bowl and whisk well. Strain through a sieve into a microwave-safe bowl - glass is best. Add the sugar, Lemon Juice, Rind, Water and cubed Butter. Microwave on High for 2 minutes. Whisk well, then microwave a further 2 minutes. Whisk again, and microwave for another 2 minutes. The Lemon Butter should be done at this stage but if your microwave is low power and you think it needs more cooking, cook for 1 minute before checking and whisking again. Pour into glass jars, put the lids on and store in the fridge. I made the original recipe. Great lemon curd. Used it in a cake. Thinking about adding a little gelatin and making tartlets with it.